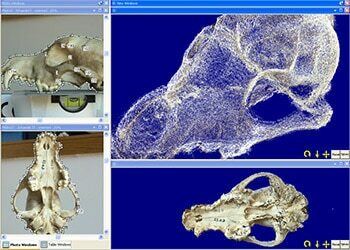 The applications for PhotoModeler Scanner in medicine and biology are in morphological measurements using 3D surfaces and point cloud measurements. Analyzing and tracking scoliosis, foot shape, and other deformities are some possibilities. This project was created by Jan Wesbuer. It has 16 photos and 8 point clouds. The resulting model has 21,000 3D points. This image is a screen shot of PhotoModeler Scanner showing a textured 3D point cloud, a 3D textured surface model and 2 of the 16 photos. "Reconstructing the three-dimensional (3D) form of living organisms in their natural habitat is a challenge and, currently, there are no methods enabling reconstruction over a wide range of field conditions and animal sizes and forms." The research team of Ylenia Chiari, Bing Wang, Holly Rushmeier, and Adalgisa Caccone from Yale overcame this challenge by using PhotoModeler. The quote above starts their accompanying paper. When they started this project they did not have access to PhotoModeler Scanner so they used another scanning method in conjunction with the base PhotoModeler product. 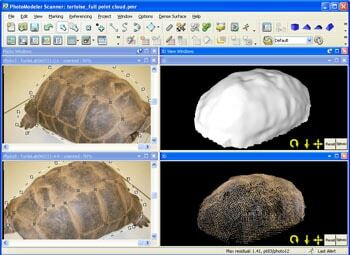 The Scanner results shown above were completed after the paper was published and show that PhotoModeler Scanner would have fit well into their work. This screen shot is of a back with scoliosis. The angle of the 3D Viewer is set so that the spinal curvature is obvious. 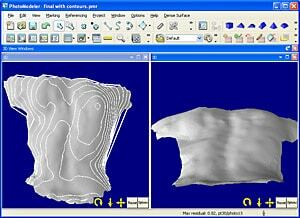 Contours (shown on left) generated by PhotoModeler Scanner may also assist with the analysis. The animation is 3D capture of another back with little to no spinal curvature.